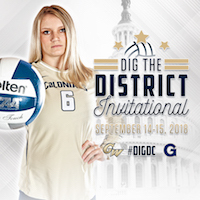 Join GW Volleyball and friends as we take on Alabama A&M at 11:00 AM for the first game of Friday's doubleheader for our #DigTheDistrict Invitational right here at the Charles E. Smith Center. Doors open at 10:00. The first (100) fans in attendance will receive a FREE coffee voucher from Dunkin Donuts for a medium hot or iced cup of coffee. Your Colonials will be back in action later on in the day as we face the Pirates of Hampton for the second game of our doubleheader starting at 7:00 PM. All Students are FREE with a valid GWorld.